Outside Concepts build great pergolas. A pergola is a great addition to your home’s exterior. Traditionally, a pergola was an open-roofed frame for climbing plants or grapes. 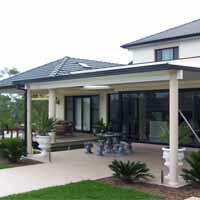 With Australia’s climate, it is common for pergolas to be roofed with corrugated polycarbonate or metal to provide year round shade and climate protection. They are an excellent addition to any patio or garden area for entertainment and outdoor meals. A pergola is not only a great way to expand the living areas of your home in the beautiful Australian weather, it is also an investment that will improve the value of your home. It practically pays for itself. Outside Concepts will custom design your pergola to your exact needs, budget and specifications. We prefer to use only the best quality timber and steel to ensure your pergolas durability and longevity. In addition, many of our customers add sun filtering with blinds and shades for an extra feature. Our design specialists have a lot of ideas on how to improve your home. Check out the gallery below for examples of our previous work from some of our happy customers. Since 1991, Outside Concepts have built a reputation based on excellence and customer service. Contact Outside Concepts to speak to a member of our friendly customer service team on how we can get your home fitted for a new pergola. We are the experts for all exterior home improvement projects, including pergolas, carports, patios, and more. You can call us toll-free at 1800 601 674 for more information on how we can help you or you can visit one of our many show rooms throughout Australia. We have locations in Victoria, New South Wales, Queensland, South Australia, Western Australia and the ACT. We will prepare a free, no-obligation quote for your custom designed pergola. Contact Outside Concepts and get started on your new pergola today!